Engage your kids with Children's Worship Bulletins! 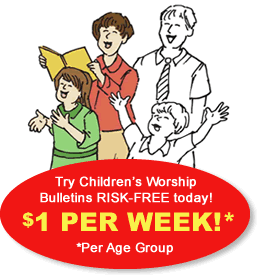 Our bulletins include biblically based Bible study activities for kids ages 3-6 and ages 7-12. Each activity takes a familiar Scripture passage from the Old Testament, the Gospels and the Epistles and presents it as a picture, maze, code or other puzzle to make learning fun. Here are just two examples of activities that you can use with our Children's Worship Bulletins to make Bible study fun for your group of kids! Print the "Jesus sits at the ..." activity page and answer key for this the Children's Worship Bulletin. Direct the children to complete the "Jesus sits at the ..." activity page. Ask the children what words solve the puzzle, (Answer: right hand of God). Direct children to, "Turn your activity page over. At the top of the page, write 'Jesus sits,' then trace your right hand onto the page. Next, write 'at the' on your traced thumb. Write 'right' on your traced index finger. Write 'hand' on your traced middle finger. Write 'of' on your traced ring finger. Write 'God' on your traced pinky finger." Read aloud Hebrews 10:11-14, 19-25 to reinforce the lesson. Print the "In Jesus We Have Forgiveness" activity page for this Children's Worship Bulletin. Direct the children to draw a picture of a time when they can pray to Jesus for encouragement on the back of their activity page. See how much fun your children will have with Children's Worship Bulletins by signing up for our 30- day Risk-Free trial. Our Risk-Free offer allows you to download, print and share bulletins with your kids ages 3-6 or ages 7-12. At the end of the month, cancel and owe nothing or pay only $4.99 a month per age level to continue enjoying all our bulletins! With today's promotional offer, you can SAVE 50% on the second age group. You have nothing to lose. Sign up today!